Maybe the flight is long, and your head feels fuzzy. Maybe you need two days of rest to heal those nasty blisters. One you'll want to read or listen to before, during and after your Camino. There’s a universal, human need to go on a pilgrimage. That’s been true throughout time and place. and also help you to consider and understand others you’ll meet along the way. 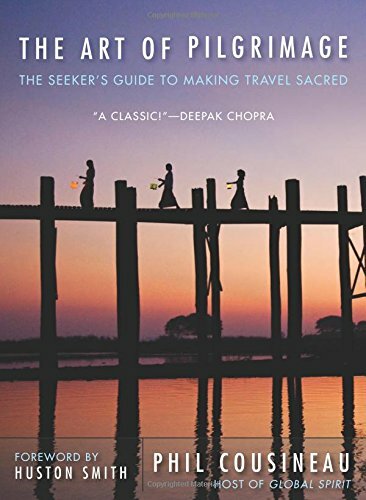 I discovered this book by chance— before my first Camino journey in 2001.
and gave me a broader spiritual foundation for journeys thereafter. To me, this book is a keeper—to be read again and again, from time to time. I got the hardcover here, so the book would last. Beautifully designed by Fireproof Games. Don't give up! Just when you think you cannot figure it out, you will. An incredible puzzle (beautiful graphics). Perfect for waiting in airports. But don’t miss your flight! Android — Get this app on the Google Play store here. The Room is for the iPad®. Just in case you need more space (to enjoy the beautiful art work). Get The Room Two. And The Room Three. ...and OMG they made another scenario! I've used this app since my first iPhone in 2007. I'm not the only one: millions of others have too! I enjoy the simplicity of the classic Penguin game...and I'm furious that I've never won the Accordion game—aargh! (let me know if you can do it!). Please note: reviews are based on the iPhone app. You're looking for 190+ things, animals, people. Bonus: some of the creatures and items show up in emojis. I love the tiny solo fish that swims back & forth. Useful for ironic responses. I decided to try it. After all, it was (and still is) free for three months. Within 10 minutes I was hooked. I "got it." After the free three-months, I joined Apple Music—without hesitation. And I still love it... one year on. Wouldn’t even think of quitting now. ©2013 - 2019 Jean Christie. All Rights Reserved. NEW: Camino de Santiago Apps lists the best apps for Apple iPhones and for Android phones. Let me know if you’d like me to take a look at your Camino app, or if I missed a great app that supports travel in general. throughout Western Europe — particularly in Spain and France. This website aims to support Camino pilgrims, and other travelers, who want to walk or bicycle on these fascinating routes. The Camino de Santiago Apps website is reader supported. That means I may earn a small commission when you use links on this website — but please know it’s never at an additional cost to you. My affiliations are listed below, and also in Disclosures. where you’ll find Packing List tips and recommendations for Camino gear and other backpacking resources. I recommend Amazon for the speed of their delivery (often free shipping), for their competitive pricing, and for their international reach. I participate in the Apple Affiliate Program. Apple, the Apple logo, and iPhone are trademarks of Apple Inc.,registered in the U.S. and other countries. App Store is a service mark of Apple Inc., registered in the U.S. and other countries. I’m also a participant in the Booking.com affiliate partner program.